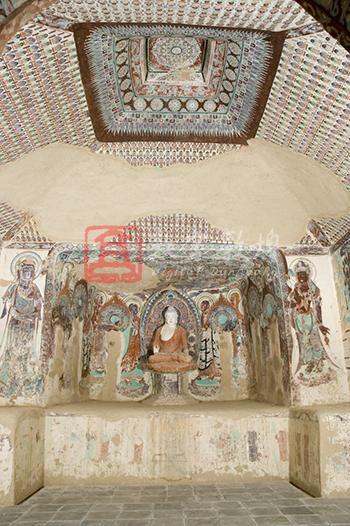 Constructed in the Jinglong era (707-710), namely the end of the Early Tang and the beginning of the High Tang, this cave was constructed as the family temple by the Yin Family at Dunhuang. Part of the paintings was renovated in the Later Tang and the Five Dyansties, and the statues were renovated in the Qing dynasty. The main chamber has a truncated pyramidal ceiling which features a medallion pattern in the center enclosed by the twisted vines and draperies that extend to the four slopes covered with the thousand Buddha motifs (partly damaged). There is a niche with a flat entrance in the west wall housing a seated Buddha renovated in the Qing dynasty, and painted images of four bodhisattvas and eight disciples. A bodhisattva is painted on each side of the niche. The south side of the adobe platform on the north side of the niche has an inscription with the portraits and titles of the Yin Family members, Yin Ciqiong and Yin Ciwang. Inside the central frame on the south wall is a preaching scene, in which Mt. Sumeru is painted in the upper with eight temple halls stand on it. The two sides and below the preaching scene are covered with more than 30 scenes of figures and buildings in the landscape context, and each scene has one or several cartouches with unidentified words. The middle part below the preaching scene is a cartouche with some words identified. The lower parts show severe flaking and loss of paint. There is an alien-styled figure on the lower right side. Opinions about the contents of the murals differ: some consider it was executed according to the Lotus Sutra, while some think it is based on the Usnisa Vijaya Dharani Sutra. We accept that the content is according to the USnisa Vijaya Dharani Sutra. The whole north wall is covered with the Amitayus sutra illustration, which consists of three parts: the pure land of Amitabha in the center, the story between Binbisara and Ajatsatru on the west side and the Sixteen Meditations on the east side. The whole east wall is devoted to the illustration of the Universal Gate of the Lotus Sutra. Right above the entrance is a preaching scene of Sakyamuni on the Vulture Peak. The upper parts of the both sides of the entrance are used for scenes of Avalokitesvara saving people from disasters while the lower parts have images of the thirty-three manifestations of Avalokitesvara. Along the entrance on the north side is an image of bhiksu Hong Ren painted in the Five Dynasties. The tent-like ceiling of the corridor has two slopes containing the images of Ksitigabha and Ten Kings painted in the Later Tang. The front chamber was repainted in later dynasties and it is severely damaged. The whole east wall is devoted to the Universal Gate of the Lotus Sutra. Right above the entrance is a preaching scene of Sakyamuni on the Vulture Peak. Around the Buddha are several bodhisattvas. The south side of the preaching scene has a pagoda in which two Buddhas sit side by side. The south and north sides of the pagoda respectively contain an attendant bodhisattva. The north and south sides of the entrance are used to depict the Salvations of Avalokitesvara and the Thirty-three Manifestations of Avalokitesvara. The former says that anyone who are in disasters of falling into water, being caught in a fire, encountering the thunder and lightning, meeting the beasts or suffering punishment, he would be rescued as long as he recite the title of Avalokitesvara. The latter includes scenes of Avalokitesvara manifesting as the Buddha, official, bhisku, Vaishravana, upasika, woman to satisfy the desires of all the human beings. Along the entrance on the north side is an life-size image of bhiksu Hong Ren in patched kasaya, who holds a incense burner and stands on a rug, with an ink inscription on the red ground above his left shoulder. It was painted in the Five Dynasties. There is a central frame in the south wall in which a preaching scene is depicted. Mt. Sumeru is in the upper, and on it stand eight temple halls. The east and west sides of the preaching scene and the space below it are 30 scenes of people and buildings against the landscape background. Each scene has a strip like cartouche with some words that can not be identified. There is an inscription right below the preaching scene with some words identified. The murals at the bottom show severe loss of paint. A non-Chinese figure is painted at the lower right side. Opinions about the contents of the murals differ: some consider it was executed according to the Lotus Sutra, while some think it is based on the Usnisa Vijaya Dharani Sutra. We accept that the content is according to the Usnisa Vijaya Dharani Sutra. In the preaching scene, the Buddha sits lotus unhisaposition on a lotus throne, with hands in Dharmacakra mudra. Beams of rays radiate from the bhru-vivarantarorna-kesa between the eyebrows and the unhisa on the head. Three circles of rays enclose the Buddha from top down. Around the Buddha are bodhisattvas and bhiskus listening to Buddh'a interpretation of the Dharani sutra. The buildings on Mt. Sumeru represent the heaven where Indra and Prince Shanzhu reside. The eight temple halls connected with corridors and dotted with trees and figures illustrate the episodes that Shanzhu was shocked in his dream and then visited Indra. The scenes on the west side of the preaching scene are stories recorded in the Introduction about Buddhapali coming from the west, encountering a elder manifested by Manjusri, returning to the west for scriptures, coming again with scriptures, offering scriptures to the imperial palace, translating sutras in the Jueming Temple, and living in seclusion in Mt. Wutai. The painting below the preaching scene depicts that Indra predicting that Shan Zhu would suffer various disasters, people obtained merits by listening to, reciting, memorizing, and writing the Dharani sutra and spells recorded in the sutra. The scenes on the east side are about King Yama visiting Indra, four great heavenly kings requesting the Buddha, Buddha telling how to recite the sutra, and Buddha predicting Shan Zhu's destiny. There is a niche in the west wall with a flat entrance. In the center of the niche ceiling is a preaching scene of Sakyamuni. The south side is lost, and the north side contains scenes of Sakyamuni preaching to people, Sakymuni returning to Kapilavastu, Rahula becoming a religious practicer, and Buddha's disciples washing Buddha's feet. The west wall in the niche shows a halo in bas-relief. There are four disciples and two halos on the sides of the Buddha. On each of the north and south walls are two bodhisattvas, two disciples and two halos. The inner brim of the niche is decorated with the lozenge motifs, while the outer brim with small medallions. The lower part of the west wall contains a picture of ceremonial utensils and donor figures. Several donor figures are painted on the north side of the platform on the south. On the south side of the platform on the north side of the niche are images of several donor figures, including a few portraits and titles of the Yin Family members, Yin Ciqiong and Yin Ciwang. The whole north wall is covered with the Amitayus sutra illustration, which consists of a middle part and two side scene respectively for the pure land of Amitabha in the center, the Sixteen Meditations on the east and the stories between Binbisara and Ajatsatru on the west. Amitabha sits in a lotus throne in the center, flanked by two attendant bodhisattvas. On the side platforms are groups of bodhisattvas led respectively by Avalokitesvara and Mahasthamaprapta. There is a group of grand buildings above Amitabha. The middle group includes the front and back halls. The back hall are enclosed by corridors on both sides, forming an independent yard. There are four buildings in the yard of the front temple, and one of those on the west side is bell tower, and the one on the east side is a scripture tower. On the upper part of the west side is the preaching scene of the Buddha on Vulture Peak, and Buddhas from the ten directions are manifested from between his eyebrows. This scene occupies some space of the side scenes used for the story between Binbisara and Ajatsatru, so the story extends to the lower part of the Amitabha's pure land and connects with the scenes of the Sixteen Meditations on the west side. The story goes on from the east to the west: Prince Ajatsatru led a palace coup, prisoned King Bimbisara, Lady Vedehi saw the King with food, and the Buddha preached in the palace. The Sixteen Meditations on the east side include the scenes of Lady Vaidehi's visualizations on the Sun, the Pavilion and the water from top down. The ceiling center features a medallion pattern surrounded by vines and draperies that extend to the four slopes. The tent-like ceiling of the corridor has two slopes containing the images of Ksitigabha and Ten Kings painted in the Later Tang. The front chamber, partly damaged, is square in plan and has a gabled ceiling, on the west slope of which are Later Tang paintngs, partly damaged.